If you are looking for the soul of what used to be SXSW, it is Secret Stages in Birmingham, Alabama which is scheduled next weekend. Last year, Secret Stages, was an upstart, almost secret festival, that saw a reunion show of Model Citizen, featuring Matt Patton (The Dexateens, The Drive-By Truckers, Paul “Wine” Jones, Universal Joint) and other actual real live rock and roll from the southeast. This year, they have a better website and an artist list that rivals anything Indie anywhere, you got to be there. Taylor Hollingsworth ( The Spider Eaters) and Kate Taylor (sister, Mariah Taylor on Conor’s label, brother Macey Taylor, Bassist supreme with The Spider Eaters, The Mystic Valley Band) singing together is a match made in heaven, (or maybe hell, if the devil has anything to do with this, which would not be surprising). You might know Taylor from previous solo albums or bands but most likely from Conor Oberst and the Mystic Valley Band. He was the guitar player who also wrote and sang “Snake Hill” and “Air Mattress” on the album Outer South as well as the first Coner Oburst made in Mexico album. If you’ve seen Maria Taylor play then you have most likely seen Kate in her band either playing keys, drums, or bass, and most importantly, harmonizing the soft beautiful back ground melodies. 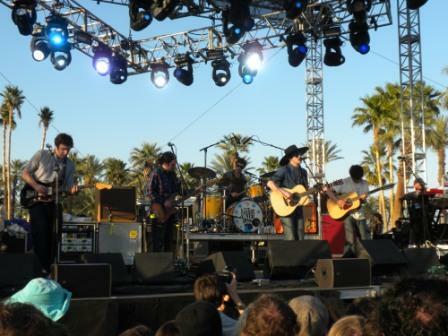 Taylor Hollingsworht with Conner Oburs – Mystic Valley Band, 2nd Stage, Coachella 2009, Kate’s brother, Macey on Bass. Nowadays, Kate and Taylor have joined hand in hand and formed a band. Ladies and Gentlemen, Dead Fingers, might just be what you’ve been waiting for! In a time when guy-girl duo’s are becoming quite popular, this one is not just some gimmick, however perfect the timing and package may be. You would almost think Kate was married to her manager, or record label exec., who was having them act like they were romantic just to sell tickets and albums. But in fact, this Alabama duo are recently married and the two just recorded their first self titled full length with Bruce Watson (RL Burnside, Junior Kimbrough, Iggy and the Stooges, AA Bondy), was released on Big Legal Mess/ Fat Possum Records early 2012. While showing a wide range of styles, ranging from duet styled songs like those of John Prine and Iris DeMent, X, or Lee Hazelwood and Ann Margaret, to straight up great classic rock bands like the Stones, Beatles, or even Traveling Wilburys, this band should find a nice home with fans of more current duo’s like She and Him, Jenny and Johnny, or Civil Wars.